How long does it take before they’ll eat it? How long is a piece of string? There are so many things that influence how bub goes accepting a new food which can be really frustrating for new parents. But before you throw your hands up in despair, please read this page and consider the very normal reason for children to not always accept new foods easily. Put yourself in their shoes! Imagine you have only been drinking milk. Suddenly you have to deal with solid things in your mouth, you’re trying to work out how to feed yourself, you’re working out how your arms work, aiming for the mouth and then what you put in your mouth has really strong flavour. That’s a lot to have to deal with! Now it’s easier to understand… up and down, erratic, fussy eating, It’s normal! Getting used to the idea that eating is unlikely to be smooth sailing will make feeding much less stressful, for both you and your bub. Remember you can’t make them eat or like something, you can just offer it up. Eating new food is a skill that infants and children learn gradually. A lot of learning to eat new foods looks like food rejection. You may not recognise the improvement. 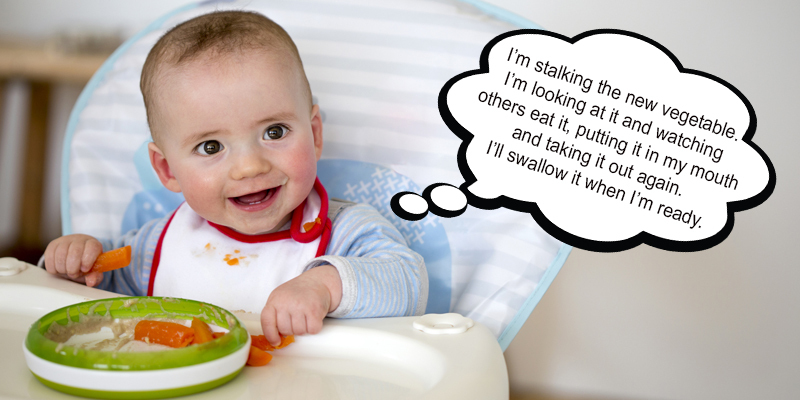 It’s a child’s way of sneaking up on a food and learning to like it. At this age babies will go from eating one food group (breast milk/formula) dairy to 5 food groups. Your baby’s taste buds are really sensitive. Flavours that seem mild to us are actually really strong for them. You will find some foods are easier than others to get baby to eat and that’s because of the strength of flavours. Mostly (but not always), you will find that babies will take to fruits, breads and cereal foods more easily than meats and vegetables. This just means a little more patience with meats and vegetables. Not just going with foods they will eat more easily. By just providing foods you know they’ll eat, they’ll be starting to set the menu already! Something you don’t want to start happening. Some of us and our little ones have much more sensitive taste buds. These people are called supertasters. This can mean foods taste a lot stronger and may take longer to get used to. Often we’ll hear stories how one child was great with food and the other is a real fussy eater. The good news is that supertasters are no less likely to have a limited diet than children without sensitive tastes, IF… they are given the opportunities to get used to new foods! Supertasters learn to enjoy strong flavoured foods as long as parents have a bit more patience and provide a few more exposures to the food in a “no pressure environment” As we know, it’s their job to decide if they want to eat or not. Why are toddlers cautious with new foods? Infants, toddlers and children being cautious with new foods and not accepting them straight away, is thought to be a response which goes back to our ancestors. Bitterness in foods and strong flavours may have indicated that the food was not safe to eat, either being poisonous or having gone off. Some of the characteristics of foods can make children wary i.e. the strong smells, bitter tastes of vegetables and meat, or the look of some foods. Being wary of new foods is a survival instinct. It’s good that our kids are a bit cautious! Being wary of new foods is a survival instinct. What’s this? It’s simply offering your bub a food without any pressure or expectation to eat it. Just adding it to meals, nothing else. What have you heard? Offer it 10 – 20 times before they’ll take it? Yep, anywhere in that range depending on your bub. Just keep in mind lots of parents aren’t patient enough. The average amount of neutral exposures given to children is three before parents decide that food is not to be included in the child’s diet. 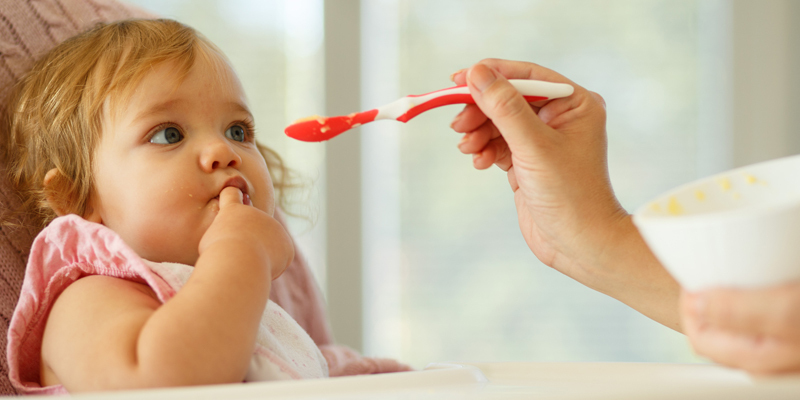 Repeated neutral exposures is how infants and children learn to eat new food. The NEUTRAL EXPOSURE: Offering your bub a food without any pressure or expectation to eat it. In our society, vegetables are considered to be difficult and this is reflected in only 5% of Australian children getting the right amount of vegetables. Most of us have learned to eat vegetables in a pressured environment. No wonder they aren’t as popular as they should be. When starting your baby on solids try and introduce vegetables and meats early on. When we delay introducing vegetables and meat, baby becomes used to only sweet and bland foods and getting vegies and meat in becomes harder. You might want to start with bland vegetables such as potato, pumpkin or avocado before you move onto the stronger flavoured ones. Include new foods with familiar foods that have already been accepted and your bub enjoys. This will take the pressure off and give them an “out”. It reassures your bub they can eat something, making them feel braver about tasting the new food. We learn to eat unfamiliar food when we see it again and again. There are a lot of things about the food that bubs might not like first up. It could be the colour, textures or flavour. Consider how it’s served i.e. cut or arranged. You can also try to combine the food with another food or sauce that may soften the flavour. Tone down strong flavours with, sauces, bread crumbs, herbs and spices. Think how you like your food and consider it when preparing your bubs food. 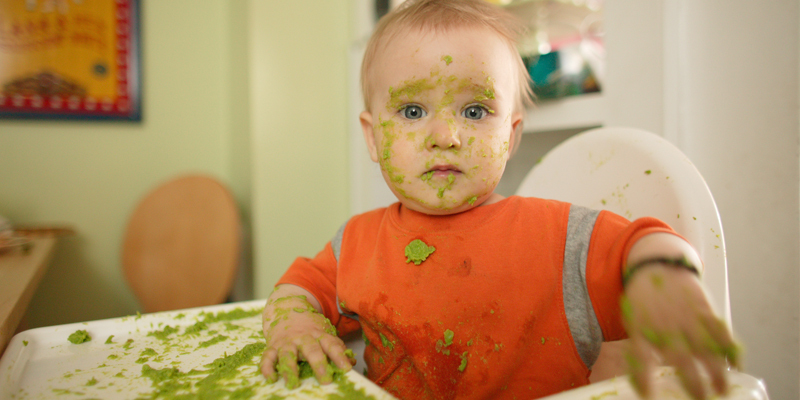 One thing we often hear from stressed out parents is that they think their bubs are fussy eaters. When we ask more questions we find out that the child is eating something from all the food groups and maybe a few things within each of the food groups. That’s OK! Keep your cool and remember the rule! You provide and then they decide. Any food learned to eat under pressure will not be food that will be liked or eaten long term.